Thrombin is serine protease blood plasma protein which converts fibrinogen into soluble fibrin to catalyze blood coagulation process. Globally commercially available therapeutic thrombin products are derived from bovine source, human plasma and genetic recombination (recombinant). Thrombin JMI, Evithrom, Recothrom, Thrombin Mochida, etc. are few approved hemostatic products in the USA and Japan. Thrombin is used in several medical surgeries in management of uncontrolled bleeding. Thrombin is also used in diagnostic centers and clinics in various applications such as clotting factor tests, coagulation assays, and defibrination of blood or plasma. R&D applications of thrombin includes in several research activities such as in vitro study, coagulation research, protein-structure analysis, medical research and biochemical research. Bovine thrombin is referred as thrombin fractionated from bovine blood. Thrombostat was the first bovine blood-based thrombin product approved by the U.S. FDA in 1943. Currently, there are few bovine thrombin brands available in market such as Thrombin JMI, Thrombi-Pad, and BioTrombina. Generally, bovine-based thrombin products have a black box warning due to the risk of abnormal hemostasis. Among the key product types, the bovine thrombin segment recorded surging demand and emerged as a key revenue contributor to the global thrombin market in 2016. TMR expects the global thrombin market to set sail on a growth path in response to the rising availability of bovine-based hemostatic brands such as Thrombin JMI. Besides this, the market will benefit from the rising adoption of bovine-based products in various research and diagnostic applications. Experts have also observed a spike in the recombinant thrombin uptake, which is attributed to lesser post-operative complications and safer hemostatic se in comparison to human and bovine thrombin. In terms of end user, the hospital segment held the dominant share of 56.2% in the global market in 2016. The rising hemostatic use of thrombin-based products during surgeries has fuelled the demand for thrombin in the hospitals segment. In addition, the market is likely to witness lucrative growth prospects in the diagnostic centers and clinics segment, which held a considerable share in the global market in 2016. Geographically, thrombin market has been segmented into major four regions: North America, Europe, Asia Pacific, and Rest of World. In 2016, North America and Asia Pacific accounted for the largest share of the thrombin market followed by Europe. The United States held a significant share of the thrombin market in North America, accounting for 94.2% share in 2016. Japan dominated the market in Asia Pacific in 2016 due to adoption of new thrombin therapies led by high awareness, significant health care spending in overall national budgets, early availability of advanced technologies, and extensive research activities in these countries. However, Europe is growing steadily while Asia Pacific is anticipated to grow faster during the forecast period due to major contribution from countries like Japan, India and China. The global thrombin market is fragmented in nature with a dispersed presence of few players in various countries. Market players with high revenue base such as Pfizer Inc., Johnson & Johnson Services Inc., and Mallinckrodt Pharmaceuticals dominate the global thrombin market. Shanghai RAAS blood products co., Ltd., Japan Blood Products Organization, and Mochida Pharmaceutical Co., Ltd. are few key players operating in Asia Pacific region. This report on thrombin market studies the current as well as future prospects of the market globally. The stakeholders of this report include companies and intermediaries engaged in the manufacturing and commercialization of thrombin products as well as new entrants planning to enter this market. This report comprises an elaborate executive summary along with a market snapshot providing overall information of various segments and sub-segments considered in the scope of the study. 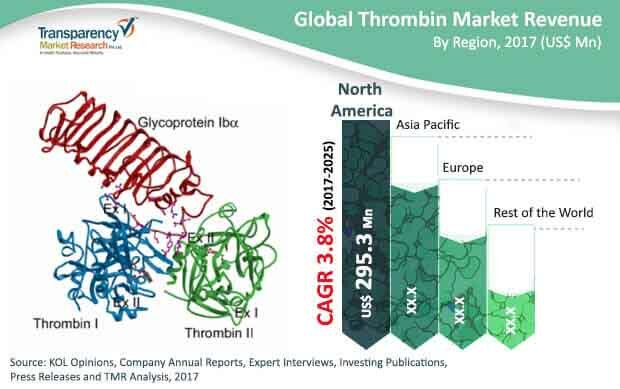 This section also provides the overall information and data analysis of the global thrombin market with respect to the leading market segments based on major product segment, dosage form segment, and end users segment. Based on the product type, the thrombin market has been segmented into bovine thrombin, human thrombin and recombinant thrombin. Each of the market segments have been extensively analyzed based on the market related factors such as increasing demand of thrombin products worldwide, and technological advancement. Moreover, historical year-on-year growth have been taken into consideration while estimating the market size. The market size and forecast in terms of US$ million for each segment has been provided for the period from 2015 to 2025. The report also provides the compound annual growth rate (CAGR %) for each market segment for the forecast period from 2017 to 2025, considering 2016 as the base year. The market overview section of the report explores the market dynamics such as drivers, restraints, and opportunities that currently have a strong impact on the thrombin market and could influence the market in near future. Market attractiveness analysis has been provided in the market overview section in order to explain the intensity of competition in the market across different geographies. The competitive scenario among different market players is evaluated through market share analysis in the competitive landscape section of the report. All these factors would help market players to take strategic decisions in order to strengthen their positions and expand their shares in the global thrombin market. Geographically, thrombin market has been segmented into four major regions: North America, Europe, Asia Pacific, and Rest of World. The market size and forecast for each of these regions has been provided for the period from 2015 to 2025, along with their respective CAGRs for the forecast period from 2017 to 2025, considering 2016 as the base year. The report also provides with market size and forecast for major countries in the respective regions. A detailed qualitative analysis of factors responsible for driving and restraining the market growth and future opportunities has been provided in the market overview section. This section of the report also provides with market attractiveness analysis, Porter’s five forces analysis, and market share analysis by key players, thus presenting a thorough analysis of the overall competitive scenario in the global thrombin market. The report also profiles key players operating in the thrombin market which are Johnson & Johnson, Pfizer, Inc., Mallinckrodt Pharmaceuticals, Shanghai RAAS blood products co., Ltd., Japan Blood Products Organization and Mochida Pharmaceutical Co., Ltd.